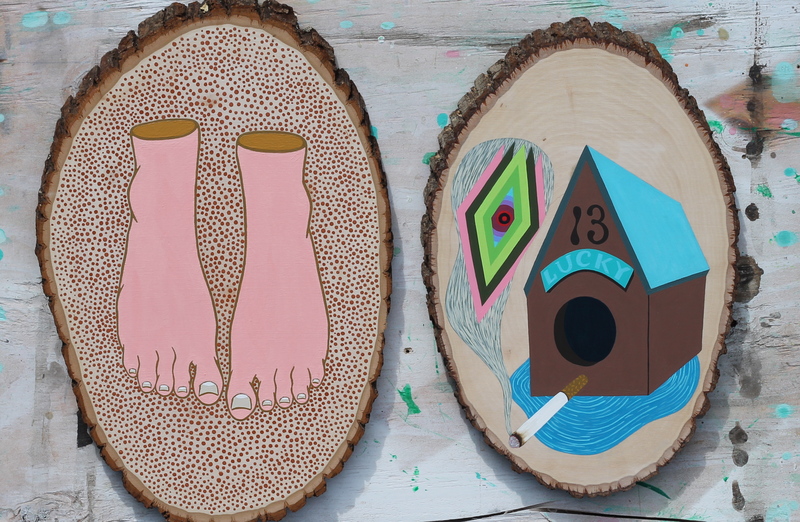 I recently completed two new paintings on basswood – you know the thin cut slice of tree trunk, traditionally used for “crafting.” The line separating arts from crafts has long been lost and a lot of really cool artists are using these to do some rad paintings. However, if you go to Blick’s website and read the product description you might not believe that. The neat thing about this product is that you really don’t know exactly what you’re going to get. They fluctuate a few inches in size and the wood grain, knots and bark edges vary as well. The best reason to use these is that they are cheap. Unfortunately, Blick currently has them on backorder. The first painting titled Waiting is fairly simple. While looking at the shape of the basswood and trying to determine what I should paint, I came up with these feet that are detached from the body. They are done in a poppy pink color and they are cleanly separated above the ankle, revealing a yellow interior. 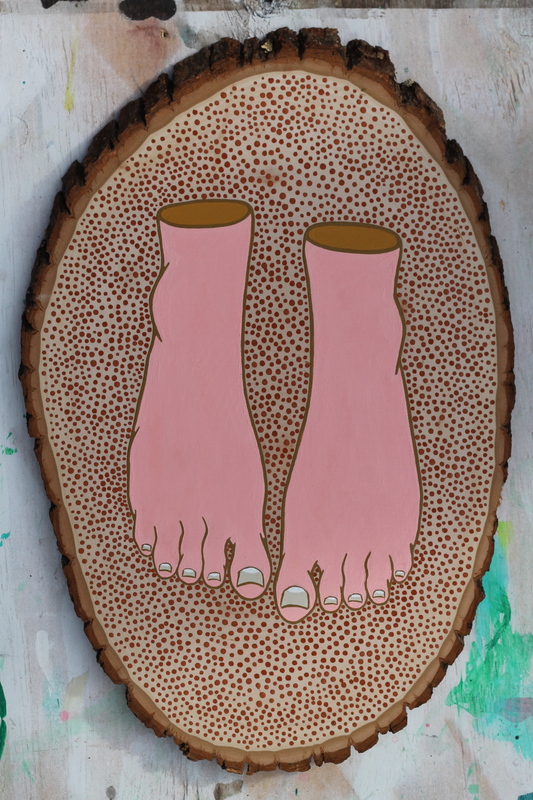 With the feet free-floating and the dots of orange surrounding them, they take on a mystical feeling. 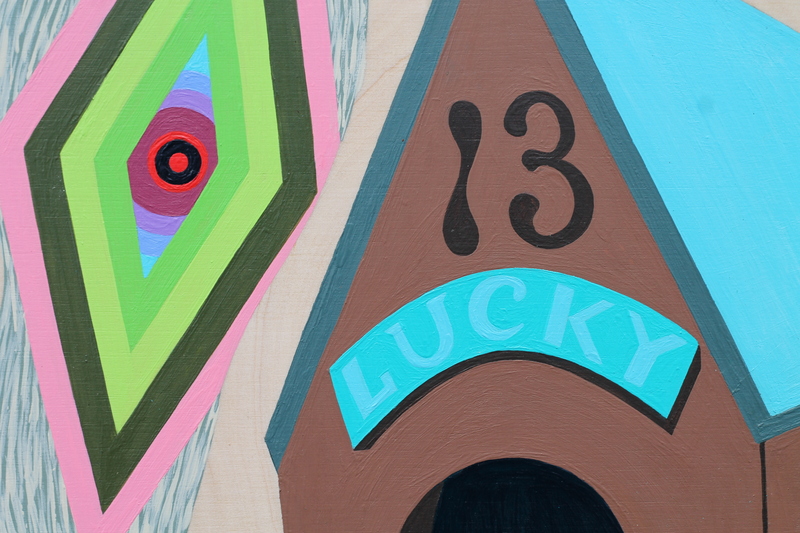 The second painting is titled Best of Luck. 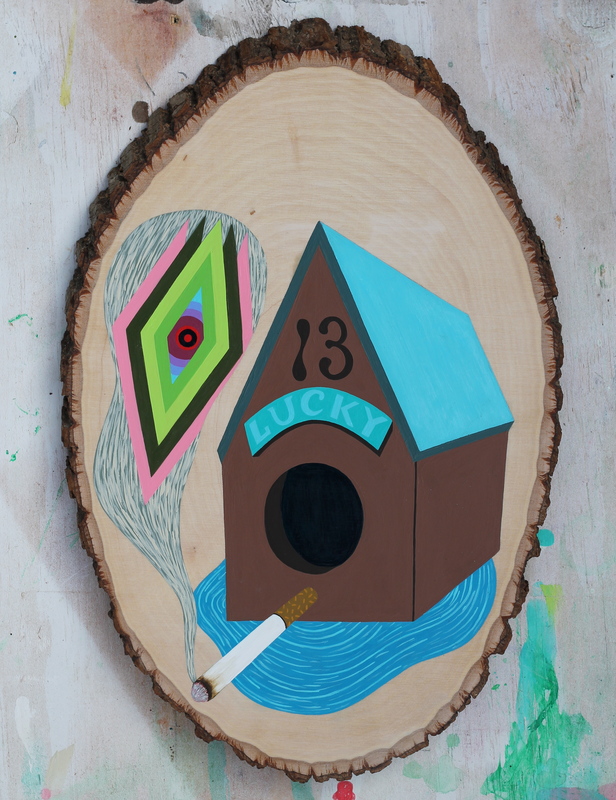 A long time ago I did a painting with a birdhouse and a cigarette and have long since wanted to do another version of this idea. For the rest of the painting, I just started playing with symbolism and metaphors. From my perspective, this image represents impending doom, but that darkness is offset by the bright and colorful palette. My favorite part of this painting would be the ominous looking eye emerging from the smoke. The cig turned out pretty cool too.